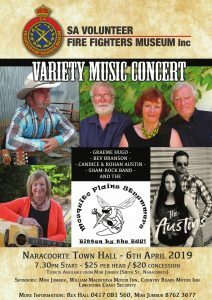 2019 Fundraiser Concert | SA Volunteer Fire Fighters Museum Inc. The committee has arranged another impressive line-up of entertainers. Thank you to sponsors and entertainers for coming forward. It looks like a fun night, so get behind it now and book your seats!